If your Salesforce implementation has a ton of records for each day, two new switches in DayBack may help. For the biggest data sets, turn both switches "on". In some orgs you may want to use just the first switch to encourage folks to select a resource folder or status before diving into their schedule. When this is turned on, the calendar will remain blank until a user applies at least one status or resource or filters the calendar using the text filter. With this set to "off"--which is the default behavior--if you load up DayBack, see your events, and then select one resource, the calendar doesn't query Salesforce again, it just filters the view you're already seeing. That make filtering super fast, but if you have a ton of events it also means that filters don't make it any faster to fetch your data. 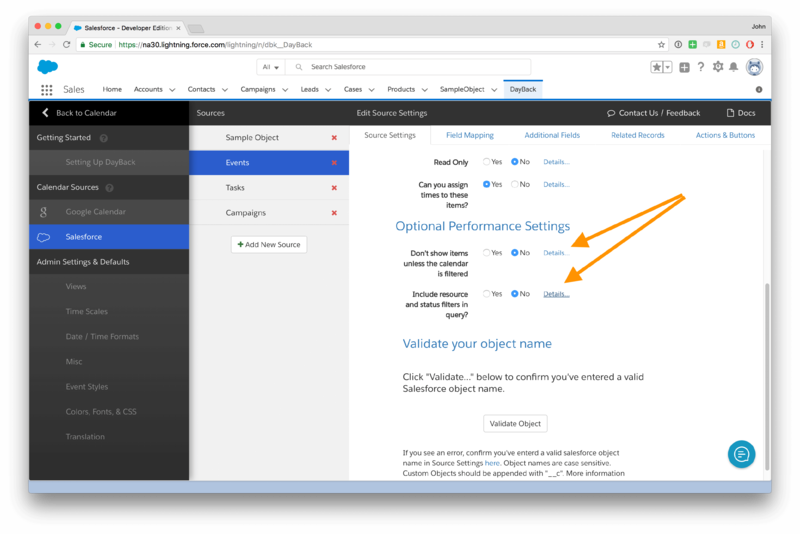 With this option turned on, DayBack includes the filters in the query to Salesforce, instead of just doing it in the view. This means that filtering could be a tad slower, but for big data sets the overall experience speeds up considerably when the calendar is filtered.